My weaving may be found at the new Eagle River Gallery, 836 W. Pine Street, Eagle River, WI. Please visit their website for location and hours. Eagle River Gallery will be on the 2018 Northwoods Art Tour, July 27-28-29, and October 5-6-7. Please stop by, the gallery artists will be providing demonstrations of their arts. I will be adding a shop page to this website. I am starting weaving on all new work, photos will be posted as they are completed and available. New work will be available by the end of May. 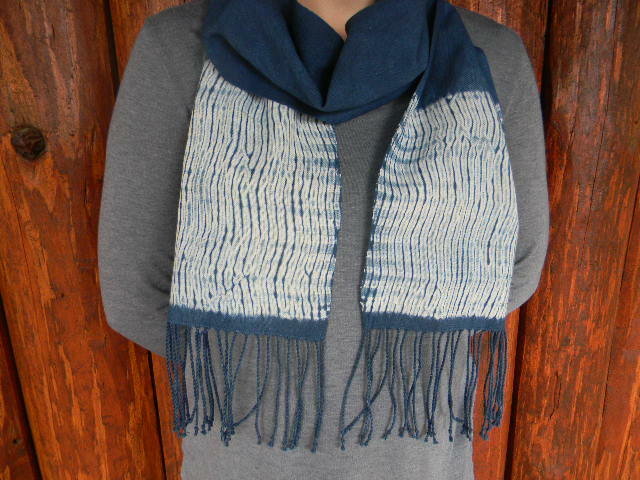 Scarves and cowls are created in the woven shibori technique, indigo dyed, and are woven with Swedish 100% cotton. Sachets are made from woven shibori pieces, or indigo dyed cotton, and filled with dried lavender, or a mixture of lavender and rose petals. My weaving may be found at Eagle River Gallery in Eagle River, WI. Shuttle Works Studio is a working studio with Glimakra looms (Standard Loom, Single Unit Drawloom, Regina Tapestry and Rug Loom, Sara Frame Tapestry Loom, Band Loom, and more; also, spinning wheels, dye area, and 1908 Gearhart sock machine. Demonstrations are available. All writing, photos, works, copyright to Janice Zindel, Shuttle Works Studio, 2009 through 2018.